On March 4, 2014, San Francisco Mayor Edwin Lee signed into law the Fair Chance Ordinance, unanimously passed by the SF Board of Supervisors on February 4. This historic victory is a new national model for the BAN THE BOX movement by prohibiting discrimination in public AND private employment, and affordable housing. LSPC project All Of Us Or None first identified the need to Ban The Box, and named this campaign, in 2004. Formerly incarcerated people who experience discrimination in applying for employment, housing, and other necessities cannot thrive and are at greater risk to return to prison. Since our victory in helping pass San Francisco’s first Ban The Box resolution in 2006, over 10 states and 70 local governments have passed Ban The Box laws; almost all focus on public employment discrimination. Most notably, in 2013 we helped pass California’s statewide Ban The Box law AB 218, which removed the question “Have you been convicted of a crime?” from state, county, city, and special district job applications. But public employment is not enough: we want to overcome discrimination against formerly incarcerated people in all areas of life. 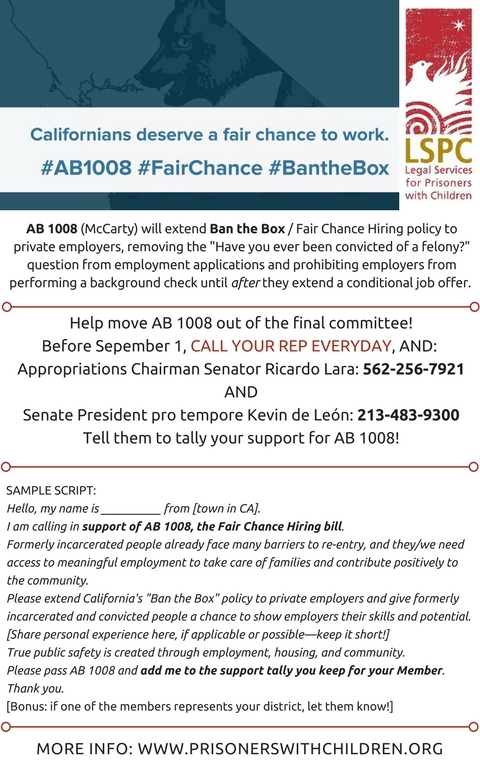 In 2010 we began organizing with allies in what became the “Fair Chance Campaign” to expand the SF Ban The Box law. This campaign sought to address private employment and affordable housing. As enacted in 2014, the new legislation prohibits pre-interview conviction history inquiries by private employers with over 20 employees, by contractors with city contracts over $5,000, and any residential building that has received funding from the City. The law also requires consideration of the relevance of applicants’ convictions, the recency of the convictions, and applicants’ evidence of rehabilitation since being convicted. You can read a summary of the legislation, the full text, and City outreach materials. Special thanks to all our friends and allies who supported the Fair Chance campaign including Lawyers’ Committee for Civil Rights, National Employment Law Project, Community Housing Partnership, and People Organized to Win Employment Rights!